Songs, speeches and the boom of artillery rang across Nelson Mandela's home village during his funeral Sunday as a tribal chief draped in animal skin declared: "A great tree has fallen." 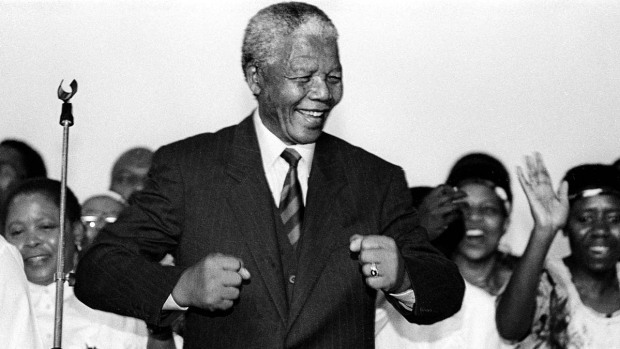 South Africa was saying goodbye for the last time to the man who reconciled the country in its most vulnerable period. Several thousand guests, some singing and dancing, gathered in a huge tent at the family compound of the anti-apartheid leader, who died Dec. 5 at the age of 95 after a long illness. When the funeral service began, they sang the national anthem in an emotional rendition in which some mourners placed fists over their chests. Mandela's portrait looked over the assembly in the white marquee from behind a bank of 95 candles representing each year of his remarkable life. His casket, transported to the tent on a gun carriage and draped in the national flag, rested on a carpet of cow skins below a lectern where speakers delivered eulogies. "A great tree has fallen, he is now going home to rest with his forefathers," said Chief Ngangomhlaba Matanzima, a representative of Mandela's family. "We thank them for lending us such an icon." The songs and speeches in the tent ceremony were broadcast on big screens in the area, including at one spot on a hill overlooking Mandela's property. Several hundred people gathered there, some wearing colors of the African National Congress — the liberation movement-turned political part that Mandela used to lead — and occasionally breaking into song. Nandi Mandela said her grandfather went barefoot to school in Qunu when he was boy and eventually became president and a figure of global import. "It is to each of us to achieve anything you want in life," she said, recalling kind gestures by Mandela "that made all those around him also want to do good." In the Xhosa language, she referred to her grandfather by his clan name: "Go well, Madiba. go well to the land of our ancestors, you have run your race." Ahmed Kathrada, an anti-apartheid activist who was jailed on Robben Island with Mandela, remembered his old friend's "abundant reserves" of love, patience and tolerance. He said it was painful when he saw Mandela for the last time, months ago in his hospital bed. "He tightly held my hand, it was profoundly heartbreaking," Kathrada said, his voice breaking at times. "How I wish I never had to confront what I saw. I first met him 67 years ago and I recall the tall, healthy strong man, the boxer, the prisoner who easily wielded the pick and shovel when we couldn't do so." Some mourners wiped away tears as Kathrada spoke, his voice trembling with emotion. Mandela's widow, Grace Machel, and his second wife, Winnie Madikizela-Mandela, were dressed in black and sat on either side of South African President Jacob Zuma. Mandela Memorial Photographer Defends Obama's "Selfie"
Guests included veterans of the military wing of the African National Congress, the liberation movement that became the dominant political force after the end of apartheid, as well as U.S. Ambassador Patrick Gaspard and other foreign envoys. Britain's Prince Charles, Monaco's Prince Albert II, U.S. television personality Oprah Winfrey, billionaire businessman Richard Branson and former Zimbabwean Prime Minister Morgan Tsvangirai were also there. More than an hour into the service, people were still filling empty seats in parts of the marquee. Soldiers moved in to occupy some chairs. President Obama spoke of former South African President Nelson Mandela's legacy of making peace by getting them to trust each other. 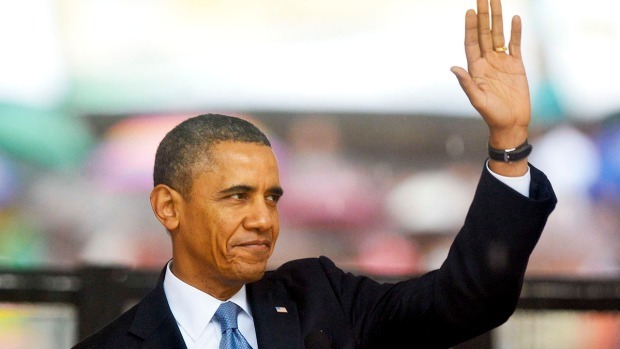 Obama spoke at the memorial for Mandela in Johannesburg, South Africa. Earlier, South African honor guards from the army, navy and air force marched in formation amid rolling green hills dotted with small dwellings and neatly demarcated plots of farmland. Clouds cast shadows over the landscape. 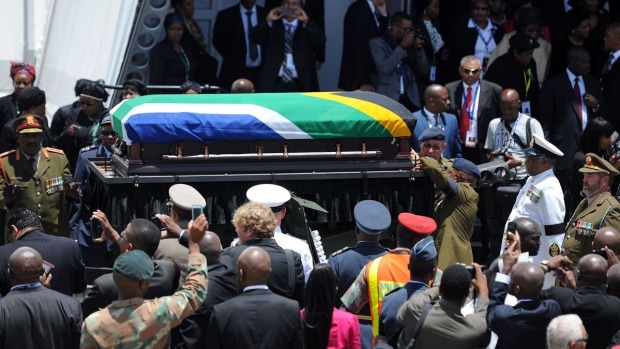 Mandela's casket, covered by a national flag, was transported on a gun carriage to the tent. After the funeral ceremony, a smaller group of guests was to attend Mandela's burial at a family grave site on the estate in Qunu, a rural village in Eastern Cape province. A 21-gun salute and a flyover by planes were among the final acts planned before the casket was put into the earth. The burial will end 10 days of mourning ceremonies that included a massive stadium memorial in Johannesburg and three days during which Mandela's body lay in state in the capital, Pretoria. VideoMandela Ceremony Interpreter Deemed a "Fake"
Mandela spent 27 years in jail as a prisoner from apartheid, then emerged to lead a delicate transition to democracy when many South Africans feared that the country would sink into all-out racial conflict. He became president in the first all-race elections in 1994. While South Africa faces many problems, including crime, unemployment and economic inequality, Mandela is seen by many compatriots as the father of their nation and around the world as an example of the healing power of reconciliation.